This weekend it felt like summer in London. 26 degrees and not a cloud in the sky. Londoners, including me, could hardly believe their luck. After months and months of grim grey skies, the weather had finally decided to take a turn for the better! Parks filled with happy families, ice-cream vans playing their merry tunes and children running around with water pistols. Lately I’ve really gone for savoury cakes and quiches. Quiche is great whether it’s warm or cold. It’s just one of those baked goods that will always be a showstopper, but a very rustic one. That’s what I like. Good old rustic homemade food. And if it looks pretty, then that’s even better! 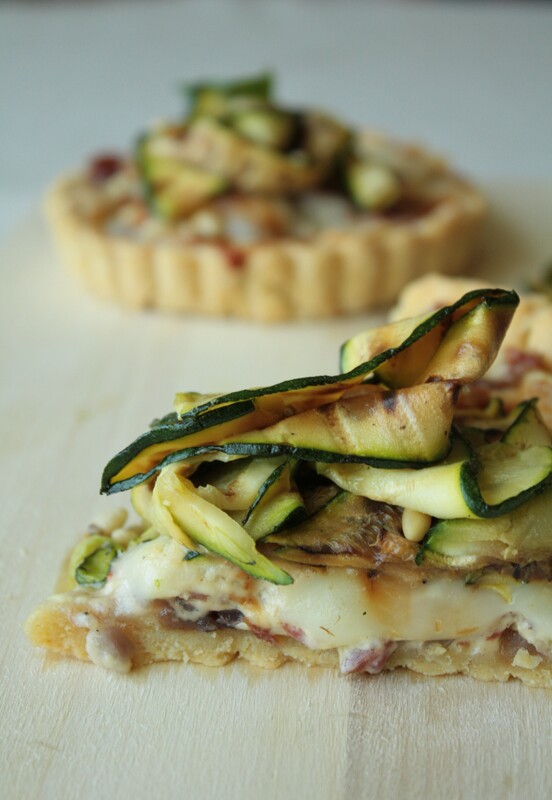 Right, over to this courgette and Taleggio tart. Quite an intriguing combination, ey? Yes, I thought so too when I came across it in an issue of Delicious magazine. For those who don’t know it yet, I’m addicted to cookery magazines and cookery books. I read them during my lunchbreaks, on the tube and before going to sleep. It’s gotten out of control. But hey, at least my addiction tastes good, right?! So, I was marked this recipe with one of my little yellow sticky notes, put it aside and rediscovered it last weekend when flicking through my stack of cookery magazines for inspiration. Taleggio.. hmmm, I wonder what that cheese tastes like. I love cheese and I love discovering new cheese. So this recipe was perfect to try out a new cheese variety. I was quite surprised to find that Taleggio is a really mild cheese with a very round taste and a strong aftertaste. The first impression reminded me of a very creamy Saint d’Albray, but then the pungency hit me and it reminded me of some cheese I had when I was little at my grandparents. No idea what cheese that was. Maybe that was even Taleggio. Although, I doubt that. R. thought it tasted like blue cheese, which really surprised me. But on second thought, yes, the pungency definitely has some blue-cheeseness to it. Strange. But delicious. So Taleggio, prosciutto and courgettes. Let me warn you, this quiche is quite salty. A bit too much for my taste. So for those who don’t like it too salty, let me recommend using a bit less cheese (say 150g) and cut down on the prosciutto. I have already cut down the amount of prosciutto from the original (which used 150g). Also, I found the recipe just too heavy, so I’d recommend swapping the creme fraiche for low fat one (something I never ever do, but in this case I would actually!). For the rest, delicious. I found the whole flavour combinations very unusual, but surprisingly fitting. 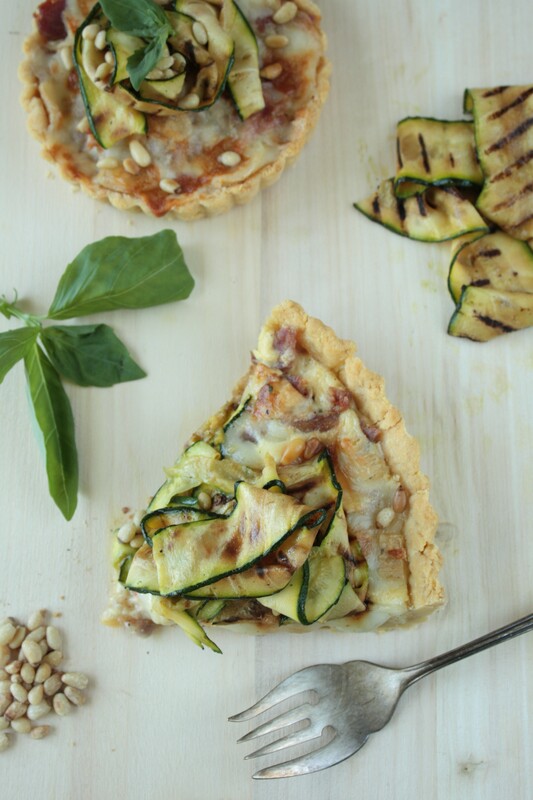 The courgette topping and basil (which I added to the original recipe) add a necessary freshness to the tart, balancing out the heavy heartiness of cheese and prosciutto. I like the polenta pastry, although it crumbled quite a lot, but hey, once it was in the mold and reattached (by just squishing the various loose bits back together) it actually baked quite nicely and didn’t break when removing from the mold. Prepare the pastry. Rub together the flour, polenta, salt and butter until it resembles breadcrumbs. Stir in the parmesan and egg yolk and add a dash off water to bind the whole thing. I found it quite crumbly and not a very easily workable dough, so add enough water (4-5 tbsp water) to get it to form into a ball without falling apart. Meanwhile, prepare the filling. Chop the onion, chili and garlic. Fry the onion in a pan with a tbsp of oil. Once it becomes transluscent, add the garlic and chili and fry for another minute. Remove from the heat. Once your dough has chilled enough, take it out of the fridge and roll out the pastry on a floured surface. Mine broke quite a bit, so I ended up transferring rolled parts into my pastry tin and just joining the various parts together in the tin by pushing the dough to stick together. Whatever you decide to do, it will be fine in the end (no one will notice you didn’t roll it the Martha Steward way, seriously!). Prick some holes into the base with a fork and top with a small square of baking paper, then fill the case with baking beans (or I used dried kidney beans, they’re cheaper than the professional baking beans – oh and don’t confuse these hard clay beans with baked beans!). Blind bake the case for 10 minutes. Remove the baking beans and spread a layer of the onion mix on top. Then tear the prosciutto into little pieces and sprinkle over the onion mix. Meanwhile, prepare the courgette topping. Use a vegetable peeler to cut thin slices off the courgette. It works surprisingly well, just make sure to choose quite thin courgettes, otherwise your peeler gets stuck if they’re too wide. Once you’ve got your batch of courgette ‘ribbons’ toss them in some olive oil and add a dash of sea salt. 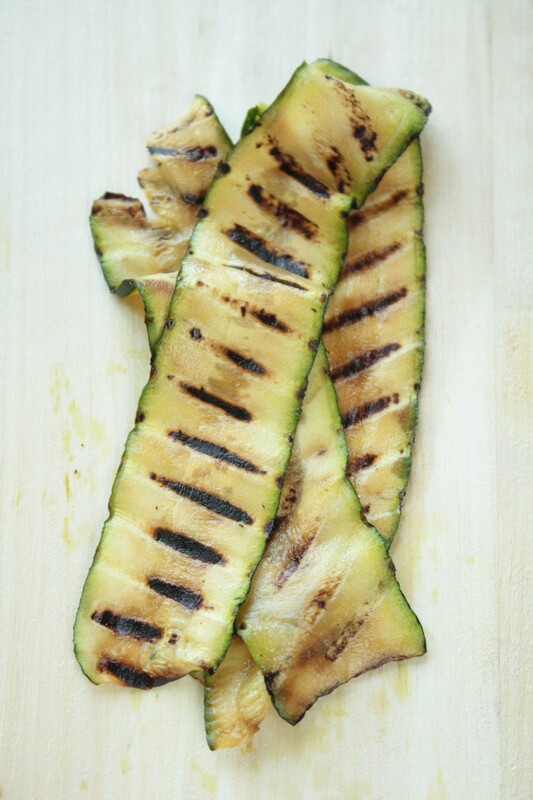 Heat a griddle pan and grill the courgettes on each side for about a minute (or until you can see dark griddles shining through). 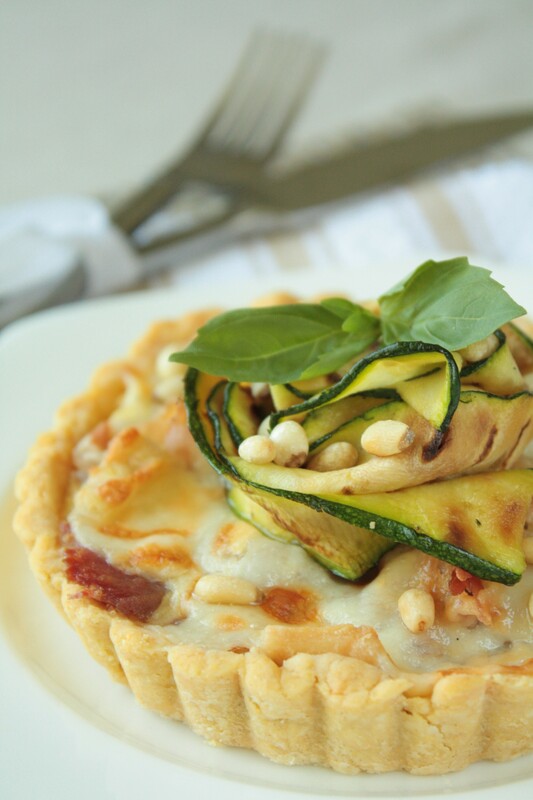 Once the tart is done, toss the lukewarm courgette ribbons over it and sprinkle some pine nuts to finish. This looks wonderful! I love the filling, it sounds like the perfect summer tart. This looks so good. I will have to try this. I love your gorgeous photos…. Those tarts look really good! I am looking forward to the zucchini. Great pictures, I especially like how the courgette is coiled up on the top. Lovely styling here. This looks really tasty! Love the hit of freshness from the courgette on top. This looks amazing. I can imagine the contrast in flavors and the different textures working perfectly together. Definitely on my to try list. I discovered this recipe two nights ago following the link from your fennel and red onion tart and immediately knew i had to make this polenta crust – only to find out that i was out of polenta. I substituted coarsley ground (with a pestle and mortar) millet and used a whole egg (it was quite small), which worked perfectly and made a wonderful crispy and slightly nutty tasting base for the quickest rustic “tart” ever: just slathered some cream chese on top of the rolled out pastry and piled on some zucchini ribbons, thyme, a drizzle of olive oil, and a little bit of mozarella before baking. I will definitely try the original version with polenta, too – thank you so much for sharing it! Good day! I simply want to give you a huge thumbs up for your excellent information you have got here on this post. I am returning to your website for more soon.